From the sea to rivers, the wildlife and marine creatures, to the coastal landscape and its birds, the designer makers of the Guild have interpreted the title, Taking the Waters in varied and imaginative ways. Sarah’s response to the exhibition has been governed by colour. Sarah uses silk yarn for her scarves and always dyes it herself. This has allowed her to create close shades of watery blues and sea greens. 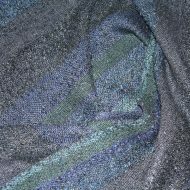 Sarah has used plain weave, and in one of the scarves crammed and spaced the warp threads, which, when weaving in a twill pattern creates a curve or ‘wave’. 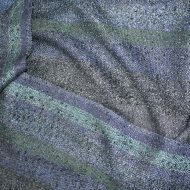 She has also used silk chiffon ribbon to add a textured border to one of the scarves. James spent much of his childhood in a large, decaying house in West Wales, barely a mile from the sea, and constantly aware of its presence. Even in the darkness of his bed at night, he could hear it sighing or roaring, and the whole landscape was shaped by the salt sea gales. James was taken by the waters. 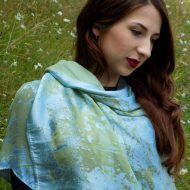 Francesca’s work for Taking the Waters is a development from fairly formal representations of seaweed into more stylised and pattern conscious designs. She has been concentrating on the colours and shapes rather than a strict adherence to realism. This abstract approach has resulted in more versatile designs, which Francesca believes are easier to accommodate in existing decorating schemes. 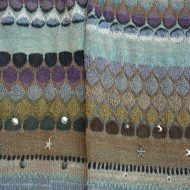 Cate will be showing a mixed fabric and hand stitched raised embroidery based on the idea of water molecules tumbling to earth reflecting and refracting the light through shades of deep indigo and bright turquoise. 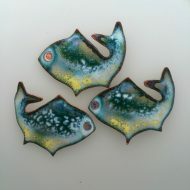 Sally has been inspired by the English seaside and has tried to represent the wateriness of the sea and the slipperiness of fish in enamel. 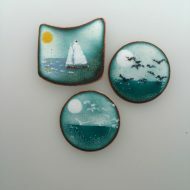 Sally has used layers of different enamel and high heat to encourage the enamels to interact. Taking the Waters to Alison’s mind has a healing and restorative effect either in body, mind or both. She finds paddling about in cool salty seawater and listening to the varied sounds lapping, crashing and thundering is incredibly healing and at times a spiritual experience. 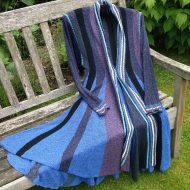 Alison has tried to capture this in the scarves and the coat, through use of colour, yarn and texture. 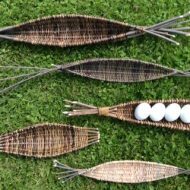 For Taking the Waters, Susan has made willow and rush vessels that follow the lines of a canoe. Slim and long and pointed at the ends. While wandering on a Cornish beach, splashing through shallow water Liz became fascinated with the colours and patterns of the stones. Sketchbooks were filled with drawings and resulted in a series of work some on organdie, some more formally hand stitched on felt. This is the largest of these pieces. 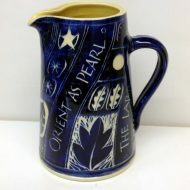 Annie has made two engraved cobalt jugs for Taking the Waters. One has text taken from Vita Sackville-West’s ‘The garden’ and the other from Virgil’s ‘Ecologues’. 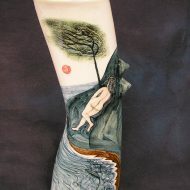 Loco Glass are showing a Landscape range, made by artfully blending different coloured glass powders, grains and canes. 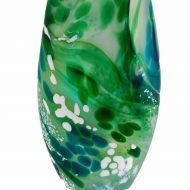 Each piece has its own individual character and the two distinct colourways are representational of the Ocean and Lagoon. 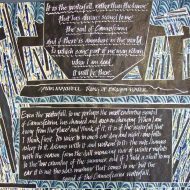 Calligrapher Andy Moore is showing five new pieces, mainly on literary themes. Two pieces relate to Gavin Maxwell’s Ring of Bright Water. Two of the other works depict Coleridge’s Rime of the Ancient Mariner, one of them including all 143 verses of the poem. The last, on a musical, rather than literary theme, is a rendering of Charles Trenet’s melodic La Mer. Helen has made a new collection of jewellery for Taking the Waters that includes a necklace of 9ct gold bars with twisted links to look like old rope and lapis luzili carved fish, turquoise bead and freshwater pearls. There are also silver bracelets with cuttlefish cast fish shaped links. 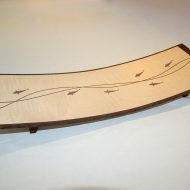 Pamela’s binding will feature coloured inlays and Palladium tooling and be inspired by the power and beauty of waves. 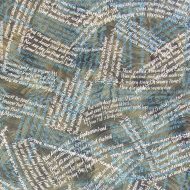 The book is titled ‘Water’ and is a selection of poems on the theme of water printed by the Incline Press 2008 set in Monotype Garamond in a limited edition of five hundred. Mizi and Nishikigoi. Over the last few years David’s work has developed a Modern Japanese style and as a result Water has been a recurring theme in his work. Water is one of the five spiritual elements of Japanese Shinto culture. The Japanese word Mizu is used to describe fluid or the formless things within our world and within the Japanese culture where there is water there is quite often fish or Nishikigoi the Japanese word for Koi Carp. Since moving to the coast Rachel’s colour palette has exploded with the ever changing coastline and the exotic flowers and foliage. This new collection focuses on the sea and her interpretation of the seas surface and white waters. Su has created a series of brooches and earrings in fine silver, gold and Sterling Silver expressing the fragility, delicacy and beauty in the details of Georgian Spa architecture through line and texture. Delicate papery surface textures are explored through embossing. 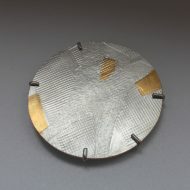 Details are highlighted by oxidisation and the Korean technique of Keum Boo, fusing fine layers of 24 carat gold to silver. These pieces represent the start of a new body of work for Su. 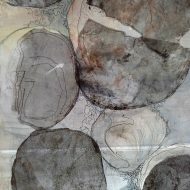 This work was inspired by Louise’s holidays in Scotland, Cornwall and the Isles of Scilly. 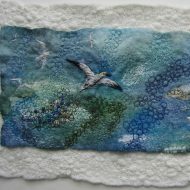 Louise loves the exuberance of seabirds in flight and the misty colours and textures of our coastlines. 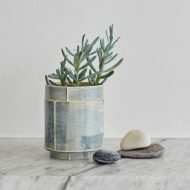 Emily’s handbuilt ceramic vessels explore surface decoration where panels of clay are treated with layers of coloured slip to achieve the desired depth of surface. Her soft colour palette draws inspiration from the clouds and landscape; the surfaces hold similarities to misty skies, memories of a walk, or a view across the sea. To Bridget, Taking the Waters conjures up the image of people swimming / bathing in water. 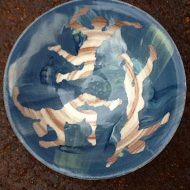 She has been making some small bowls 7-8″ to which some torn paper stencils of figures have been attached using water and a sponge. She has been experimenting with different coloured slips which are poured over the paper resist figures with a splash of contrasting colour and has then shaken the whole bowl vigorously in a circular motion to create a bit of movement /marbelling with the still runny slip. 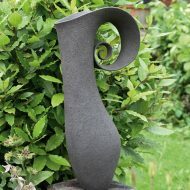 Winchcombe Pottery have interpreted the theme of Taking the Waters with a water fountain made up of three bowls.